If you have ever wondered about the man that Robert Menzies College (RMC) is named after, then this article might give you some idea. 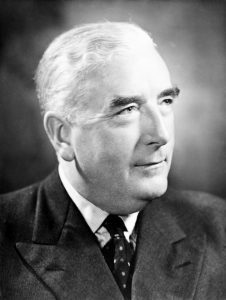 Sir Robert Gordon Menzies embodied the attributes that RMC strives to uphold today: academic excellence and leadership, obligation to the community and devotion to the Christian faith. Menzies grew up in a lower income household. He, along with his parents and four siblings lived at the back of the general store that his parents struggled to manage in the rural town of Jeparit, Victoria. He was intelligent, making his way through the local school in Jeparit into the Humffray Street state school. From there, he received a much needed scholarship to Grenville College, a secondary school in Ballarat. After relocating to Melbourne in 1910, he enrolled at Wesley College. Hard work and perseverance led him to the University of Melbourne to study law in 1913. In 1916, he received a Bachelor of Laws with honours, and in 1918 he received a Master of Laws. Despite his economic disadvantages and the pressure of World War I, he was determined to succeed. Encouraging learning and academic excellence, including Christian scholarship. Today, Robert Menzies College encourages the same scholarly determination in our own residents. We appreciate the struggles and pressures of university, which is why we do everything we can to help residents thrive. Several different scholarships are available, Academic Tutors from every faculty are accessible throughout the year, and we further encourage academic excellence by recognising high achievers at our formal events. 1918, a member of the Victorian Parliament in 1928, and then the Attorney-General and Minister of Industry in 1934. His commitment to hard work set him up for his most prominent job as Prime Minister in 1939. Australia’s longest serving Prime Minister, Menzies served for 18 years from 1939 to 1941 and 1949 to 1966. Creating a caring community in affordable, quality accommodation. The RMC community is an integral part of the service we provide to residents. Many of our students are international or non-local and our community helps them to adjust to this new time in their lives. Many RMC residents make life-long friendships at College – some even find their future spouse! Menzies was raised in a devout Protestant household, with a father dedicated to the local nonconformist church. His Christian faith remained important to him throughout his life – he led the Students’ Christian Union during his studies at the University of Melbourne and remained devoted to his Scottish Presbyterian heritage throughout his life. When he died in 1978, his funeral service (one of the largest state funerals held in the country) was held in Melbourne’s Scots’ Church. Reaching people and teaching them to become mature followers of Christ. RMC strives to be a leader of the Christian faith. Our church, Trinity Chapel Macquarie (TCM), holds services on 10am and 5:30pm each Sunday that everyone is welcome to attend. Our residents mainly attend the Sunday evening service, and we also have chaplaincy residential tutors who organise Think True sessions where students have the opportunity to gather and learn about Christ. Bible study sessions are hosted around the College, as well.